Preheat oven to 375°F. Spoon prepared Betty Crocker™ Blueberry Muffin batter into muffin tins lined with cupcake wrappers. In a small bowl, combine crushed Cinnamon Toast Crunch™ and melted butter. Sprinkle Cinnamon Toast Crunch™ on top of each muffin cup full of blueberry muffin batter. Bake in preheated oven fro 17-20 minutes, or until the edges of the muffins are light, golden brown and the tops of each muffin spring back when touched lightly. Cinnamon Toast Crunch isn't just a breakfast cereal. It can also be used as a simple streusel, amping up the yum factor in a ton of recipes like these Bakery Style Blueberry Muffins. You don't have to run to the local bakery, slap down wads of cash, and carefully carry home a load of professionally baked muffins to get that classic café flavor. 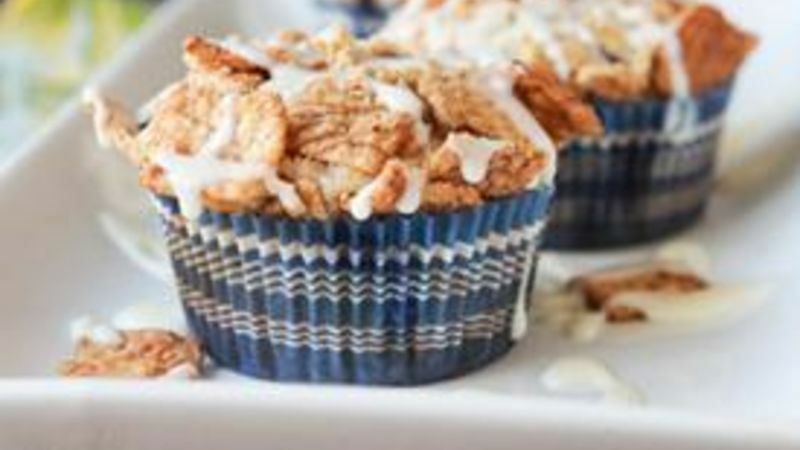 Turn your kitchen into an at-home bakery with these supremely easy Bakery-Style Blueberry Muffins with Cinnamon Toast Crunch Streusel.